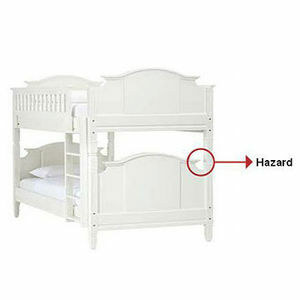 The end structure of the bunk bed can pose an entrapment hazard to young children; children can get their necks caught in the opening between the post and the decorative molding. This recall involves about 405 Madeline bunk beds. The bed is white and made of wood and medium-density fiberboard. It has guardrails on either side of the top bunk and a ladder that attaches to the side of the beds.